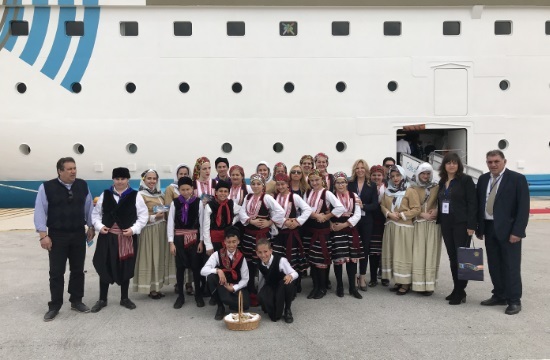 The municipality of Rhodes reserved a warm welcome to the 650 passengers of the Celestyal Olympia cruise ship, the first cruise ship that arrived at the port of Rhodes for 2019, en.protothema reports. The reception featured music, traditional dances, and gifts, with the executives of the Tourism Directorate of the Municipality of Rhodes in attendance. The Celestyal Olympia cruise ship began its journey in Piraeus on Tuesday and stopped at Mykonos and Patmos before arriving in Rhodes early on Wednesday morning, carrying 650 passengers, mostly Americans (550), as well as Spaniards, Brazilians, Argentines, and British. Celestyal Olympia’s next stop will be Heraklion, Crete, and is set to return to Rhodes on Wednesday, March 27, 2019. The Deputy Mayor of Tourism for Rhodes expressed her optimism concerning cruise ship arrivals on the island, stressing that a 15% rise was recorded so far.